It is possible to own and operate a USA Bank account without being in the United State but for legitimate use only like PayPal verification, sending and receiving payments etc. It can be used to transfer funds, bank wire, receive dollars and a Payoneer MasterCard can also be used to withdraw money from any ATM Machine in your region. You can get or own a U.S Bank account for business and payment purposes through seeking and operating a Payoneer debit card. Payoneer mastercard is accepted all over the world to buy online, sell online, send and receive money online and can also be used to verify a PayPal account any where on the internet. You can get a Payoneer MasterCard from sites like from Fiverr, infolinks, Reviewme, SponsoredReview or directly from Payoneer home page. Every Payoneer Card has a USA Checking account attached to it and can be used to verify a PayPal or other payment gateways. The checking account you will be given during the time of registration can be used for other various online transaction. 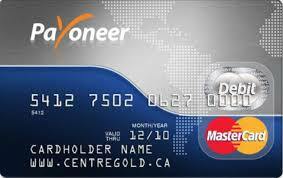 You can get the MasterCard by choosing Payoneer as your preferred payment option from sites like fiverr, infolinks, payoneer home page, or other sites that allow you to receive your online earnings through Payoneer MasterCard. If you need a USA bank account for business purposes or for PayPal verification purposes, then use the method above, i just mine through these means. Thanks for reading.